Richard Stainthorp to ask the Lead Councillor for Culture Heritage and Recreation: William Marshal As I am sure the Lead Councillor is aware 2019 is the 800th anniversary of William Marshal dying in Caversham. William was eulogized by Stephen Langton as 'the best knight that ever lived‘, he served five English kings and was Lord Protector and regent of the kingdom during the reign of Henry III. As is the case for many of us Caversham was his favourite place. Can the Lead Councillor tell me what plans there are to commemorate the anniversary of this great man's death ? REPLY by Councillor Hacker Lead Councillor for Culture, Heritage and Recreation. Thank you for your question Mr Stainthorp and I am indeed aware of the anniversary of the remarkable William Marshal and the strong connection he had to our Borough. Unsurprisingly, we do indeed have plans to commemorate this particularly significant anniversary of his death. Reading Museum is leading on work with local partners to mark this historic anniversary with two events on Saturday 11 May (which also coincides with the Forbury Fiesta). The Friends of Caversham Court Gardens will have a ‘pop-up’ William Marshal exhibition at the Abbey Gateway (10am -3pm), which will also provide another opportunity to visit the newly restored medieval Gateway. While at the Museum there will be an afternoon talk (3pm 4pm, booking essential via the Museum) on William Marshal by Dr Elizabeth Matthew, University of Reading. This fascinating talk is part of the popular continuing series of public lectures relating to the Abbey Quarter organised by the Museum and the Reading Abbey Revealed project. During May half term on Tuesday 28 May the Museum is running ‘The Greatest Knight!’ family workshops. Children will be inspired by the greatest knight to decorate their own signature helmet and shield (1-hour sessions starting at 10am, 11.15am, 1pm & 2.15pm, booking via the museum). You may also be interested to learn that after Marshal died at Caversham his body lay in state at the Abbey until it was transported for burial at the Temple church in London. The Abbey is of course famous as the burial place of King Henry I, but other members of the AngloNorman/Angevin family were also buried at this favoured royal abbey. 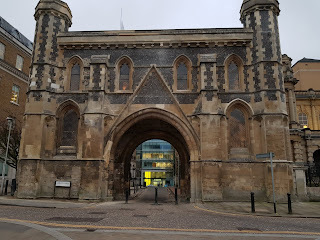 The Reading Abbey Revealed project and the University of Reading are exploring this subject with a one-day conference ‘Royal Death and Burial Reading Abbey in Context’ on Saturday 6 April (9am 5pm, booking essential). Internationally renowned experts will set Reading Abbey in its context as one of the great royal mausoleums of medieval Europe. Also! Head to www.cadra.org.uk to find out about their plans to provide an information panel on William Marshal on Cavershsm Bridge plus an expert speaker on the subject at their AGM. Copied using a text scanner - apologies if there are errors!